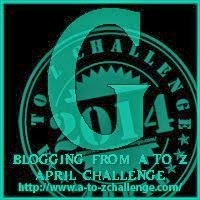 The A to Z Challenge is rolling on, and its now Go Time!! We are getting into the meat for the challenge. Many of the participants are doing a great job, and moving forward. I want to talk about Go Time. Wife of Tronster and I really enjoy road trips. We decide a couple of weeks in advance, and then we prepare, and then we go. We also do a lot of traveling around the area for different activities. Such as going to the movies, or visiting friends for cookouts and other local events. I am sure there are many men who will agree with me for the following statements. When I look at where we have to go, I think about the time to travel to be there about 15 minutes early. Time to find parking, get a seat, or talk to the host. It takes me about 30 minutes to prepare for any departure. Now, when I am ready to go, I am ready to go. I ask wife of Tronster, Are your ready? She will say "I have been waiting on you". I am taken aback, saying, alright its go time. We load up in the car and off we go. 1 mile prior to arrival, she drops down the passenger mirror and puts on make-up, jewelry and we end up setting there for 5 minutes. In conclusion, there are different interpretations of Go Time.